We shared a similar post on Pixar’s 25th Anniversary. Everything that was shared still holds true, so I have shared it below once more, for the studio’s 28th Anniversary! On February 3, 1986 Pixar became an independent company. While it would be almost ten years until they released their first feature film, Toy Story, the independence was a major step (albeit a scary one). Unsatisfied with their focus on manufacturing hardware, the fledgling studio set out on a long journey, where they sought to create films. The effects of the hardware they created are still a factor to this date and will continue long into the future. Why is that? 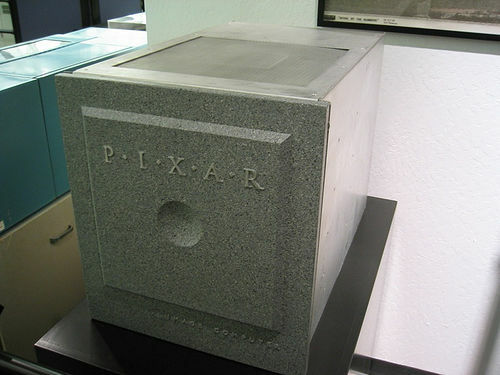 The name of that hardware was the Pixar Image Computer and it became the namesake for the studio. The past can be difficult to peer back on, but it is important to reflect on, as it brings entities to their current position. It is challenging to think of a time when Pixar was not a giant, as the animation studio has become a powerhouse in filmmaking. Twenty-eight years ago, today, there was much uncertainty surrounding the studio. However, it was the perseverance of individuals such as John Lasseter and Ed Catmull that kept the studio afloat. Hell-bent on releasing a quality film, they did not take the easy route. Rather, their attention was fully squared on creating something special – and create something special they did. Actually, they have continued creating something special for years and there is no end in sight. You can tell that each film the studio releases is a labor of love. Whether it is for a short that lasts but a few minutes, or a feature-length film that runs 90-120 minutes, that love is not only visible – it is obvious. Why else would you put together a rigorous process for films to make it to the big screen, when it would be so easy to take less risks? That kind of effort is reserved for those who are passionate about creating a great film. Some might say that the studio has started to delve into more sequels and as a result Pixar is not as original as before; however, it is clear from its upcoming films, which include Inside Out, The Good Dinosaur, and the Untitled Dia de los Muertos film, there is still plenty of originality and creativity at the studio, and is not going anywhere. Happy 28th Anniversary, Pixar! May you continue to flourish and blow people away with your films because a world without Pixar Animation Studios is surely a sad one indeed.